Today I will show you a couple more from my El Corazon HAUL. You can read a bit about my experiences with the official russian webshop HERE if you consider ordering from them (which you totally should, because they make some awesome polishes). I didn't felt blogging this week, but I forced myself to write this post today. Winter equals knitted, I like actual knitted clothes too, but I also like to paint knitted pattern onto my nails. I never done 3D knitter design though, usually it's done with gel, but I experimented a little, and I've found a really nice alternative. A couple of days ago I remembered that I used my NCLA Lead Vocals, ME! polish ages ago, so I grabbed it and painted my nails with it. I left it on it's own for about a half day, but then I just had to paint something over it. Today I will show you something really interesting and useful thing that will change your way of thinking about nail stamping. The thing what I'm talking about is called stamping guide, and it's from Bundle Monster. I'm going to show you the upcoming collection from Cupcake Polish. It's gonna seriously blow your mind! I think using small stones/crystals are something that you love or hate. In general I don't like to use big studs, 3D decorations (like bows and such), but I follow quite a lot of asian nail artist on Instagram, and they often use stones like this, so one day I realised - after seeing so much manis with stones - that I quite like this form of nail decorations. So I'm going to show you 2 nail art today, including stones that I got from Bundle Monster for review. I feel like I've used this pattern a 100 times. This is the only pattern that I painted on my nails more than twice. I don't like to use patterns multiple times, because there's so much designs that I have to try out, but this pattern is somehow different. Geometric nail art for today. Because I haven't done anything like this in a while. 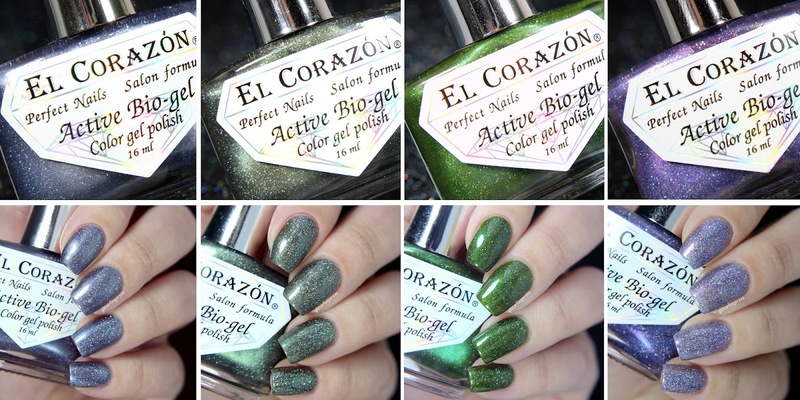 I ordered a couple of (11 to be exact) nail polishes from the russian nail polish brand, El Corazon. They offered free shipping through December, so I thought now is the time :D I'm going to show you 4 today, and they all from the Gemstones collection. I feel that I haven't done anything real nail art lately, and if I'm thinking it throug, I really haven't. Since my Christmas nail art I didn't used any of my detailing brushes nor my acrylic paints. So it was really time to sit down and paint something. Hi! I hope everyone having a great new year so far. Today's blogpost is all about glitter and bling. I got 3 (out of the total 4 shades) from the - fairly - new Avon Magic Effects line, it's called Liquid Sequin.